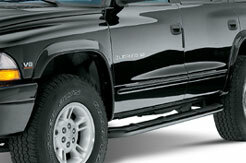 Add the perfect finishing touch to your truck or SUV with Westin's 3 diameter Signature Series step bars. The Signature Series step bars are available in a chrome plated or black powdercoat finish. These bars feature a recessed step area with a UV resistant step pad that won't fade or crack even under the harshest conditions. These step bars are manufactured and designed for vehicle specific applications utilizing the vehicles OE mounting points for superior strength and easy No-Drill installation. These are on order they should be arriving here soon. So get your order in early before we run out of the first order.